Seen as one of the most attractive of all of the Australian climbing plants, Pandorea are commonly called, Wonga Wonga Vine, or ‘Bower of Beauty’. 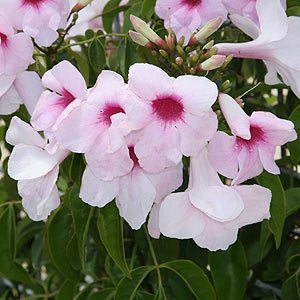 The botanical name is Pandorea jasminoides, and this is a tough native evergreen climbing vine from sub tropical areas of Australia, found in coastal rainforest areas from Northern New South Wales through Southern Queensland. They do grow well in cooler climates and some excellent specimens can be found in Victoria. Attractive glossy green foliage and flowering from early summer through to autumn from pure white to pink with a deeper throat. Full sun to semi shade is best for Pandorea jasminoides where it will develop into a dense screen and is ideal as an evergreen climbing screen. Pandorea or ‘Bower of Beauty’ also comes in a variegated form. This is a fairly vigorous vine, especially in warm climates and can become a little rampant. It thrives in a humus rich moist but well drained soil and will grow well in part shade. In cooler climates full sun and a protected position is required. Pandorea jasminoides does require protection from frosts and will need additional water during dry periods for the first 2 years, reasonably drought tolerant once established although a cool moist root run is beneficial. Flowering throughout the year it makes a wonderful cover for a fence or if allowed to scramble over a pergola. It can also be used as ground cover plant. reasonably hard with very few problems. The species has flowers that are trumpet shaped and pink with a deeper pink to maroon throat. 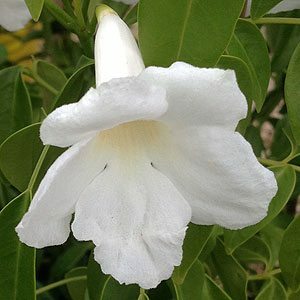 Pandorea jasminoides alba is white flowering with the same deeper colored throat. The pure white flowering cultivar ‘Lady Di’ has clean white flowers very attractive. Common Name – Pandorea, Wonga Wonga Vine, Bower Vine. Foliage – Deep glossy green. Growth Habit – Climbing or scrambling. Frost tolerance – Medium to low.